A rainbow neon glitter topper with pink, magenta, orange, green, and blue neon glitters. The glitter density was good and it's just so FUN! You may have seen something like this from indie brands before, but it's pretty cool to see a major brand embracing the neon glitter. A neon glitter topper with pink, magenta, and orange glitters. A neon glitter topper with blue, green, and purple glitters. I wish my camera had been able to accurately convey how neon this one is! It's a super bright neon yellow, especially when layered over white. It went on smoothly and evenly. I'm pretty obsessed with this gorgeous deep sky blue creme. Of the two blues in this collection, this one is my pick. This is another one where the brightness just did not translate well to my camera. 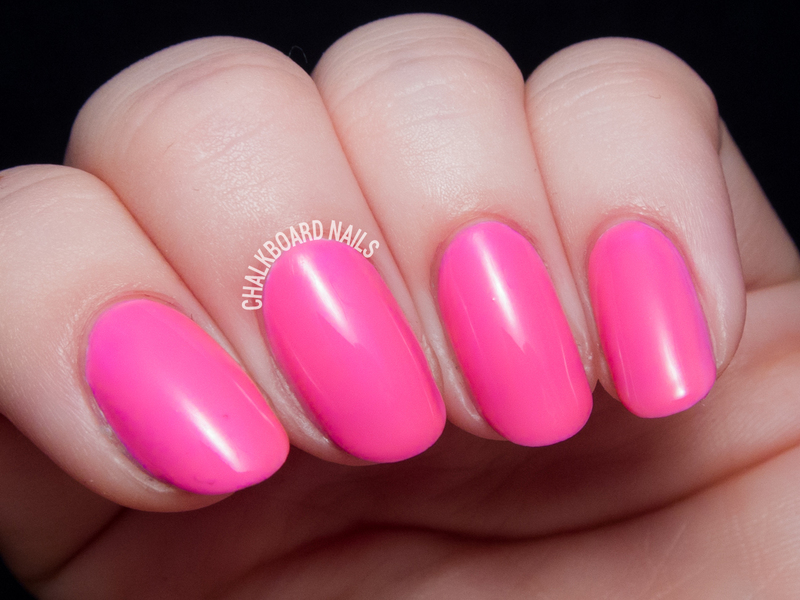 This bright pink creme is super gorgeous. It's very Barbie-esque, but in the best of ways. 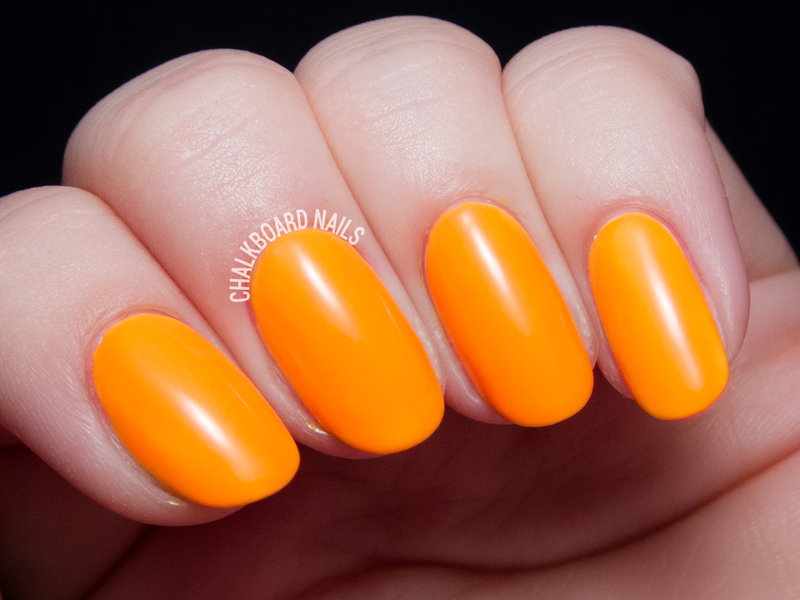 A neon creamsicle orange. So citrusy, cheery, and bright! A bright purple creme. I'm obsessed with this shade of purple. So deliciously bright. It went on a little streaky but mostly evened out after the second coat. A bright neon traffic cone red-orange. This is another standout for me, it's great! A light sky blue creme. This is the lighter counterpart to DJ Blue My Mind. A great pool blue for summer! The bright magenta huge on this one is gorgeous, but I found the formula to be a bit finicky. It was streaky for the first two coats but evened out on the third. Overall, I found the formulas to be on the thinner side. During application, it was best to get a slightly larger bead of polish than I would normally use, and polish it on to the nail with a light touch to minimize streaks. As you may have noticed, I decided to swatch all of these over a white base to boost the brightness. I wasn't sure which ones would need it and which ones wouldn't. As it turned out, not all of them needed it. 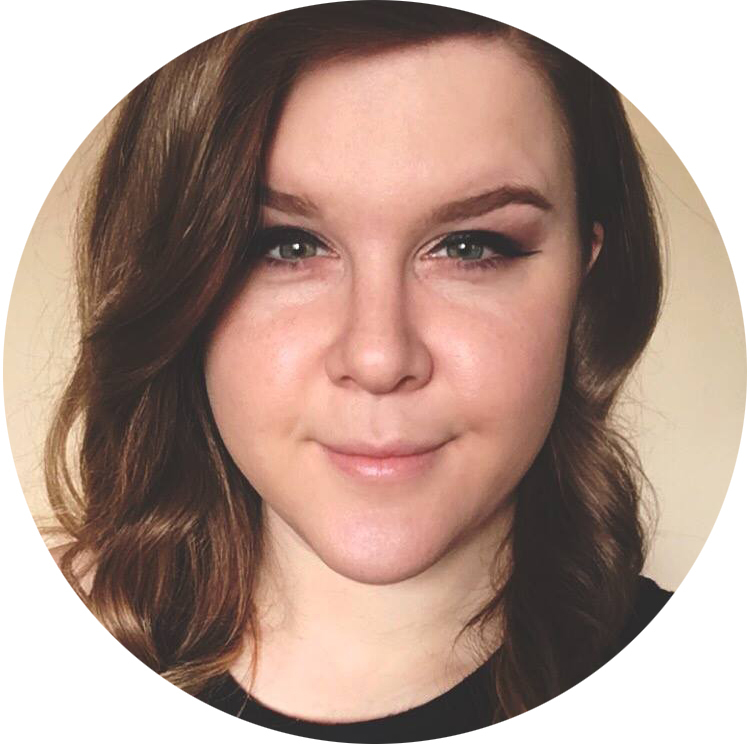 You can check out jessface90's swatch video to see many of them swatched alone. I wish that the neon-ness of these had come across more clearly! They're bright and happy and lovely. Overall, it's a classically China Glaze collection full of bold, fun colors and trend-setting glitters. This collection is set to release in April, so start gearing up for summer now! I have a ton of those neon glitters from the indie world, but I really like the size of these glitters. Perfect! 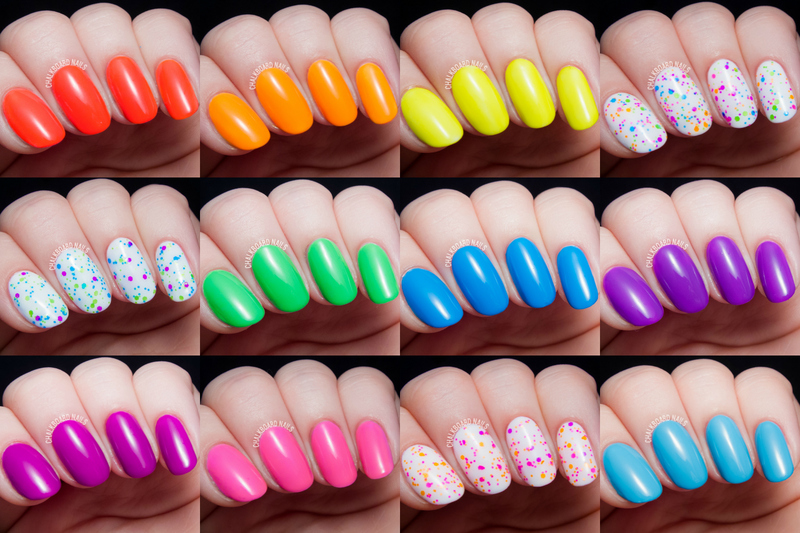 What an awesome collection, China Glaze does neons right! I haven't jumped on the matte neon glitter party bus yet, but I lurve Point Me To the Party! Super excited about this collection! Neons are always a favorite of mine and it is fantastic to see a major brand with a neon glitter topper!!! These look awesome! Loving those neon glitters. Oh my! These are brilliant! And my favourite UK polish stockist has them available for pre-order (Nail Polish Direct). There is a Baby Beats set with the Red-y to Rave, Daisy Know My Name, Violet Vibes, Glow with the Flow, DJ Blue My Mind, and Treble Maker shades, which is perfect for me! I'm never going to use full size bottles of all of those, so I love the mini sets. 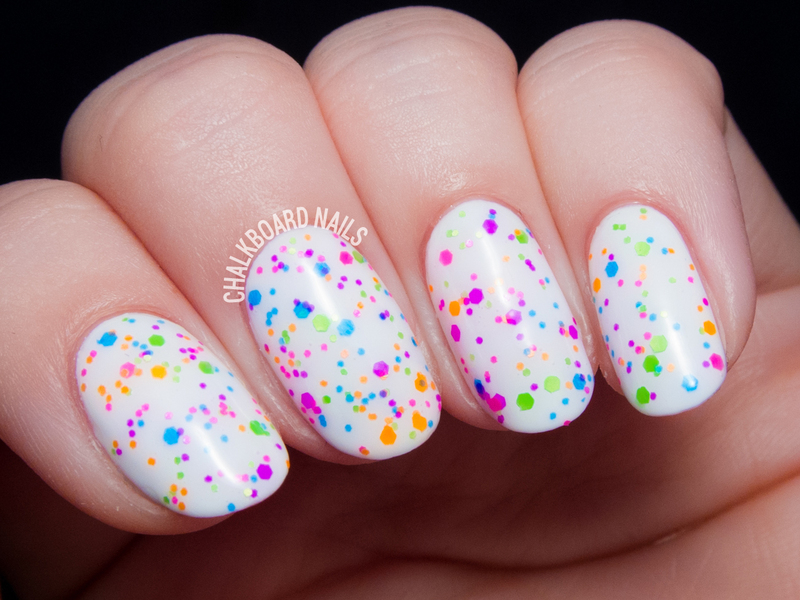 It's so exciting to have China Glaze release a polish like Point Me to the Party! I have to admit I was a bit confused with these. The display makes it look like these glow in the dark, but you didn't mention anything about that. So I did some googling and they glow under black light! Did you know that?!? I read this post 4 times to make sure I didn't miss anything, but maybe I did? Now I want these even more! I need every single one. Wish they were coming out this month because China Glaze is BOGO free at Sally. I'm loving those neon glitters! I think this is one of the better collections released this Spring, even though neon is nothing new but these colors cover all bases if one is looking to add neons to their polish stash ... because I most definitely am! And can we just nominate "Can I Get An Untz Untz" ... as Thee Best Polish Name Ever??? Oh, Gad. I must have them all. Seriously! There isn't a single one I don't love. Your swatches are amazing, btw! I think it's safe to say that I like every single color in this collection, even the glitter toppers. In the past, CG neons have been very chalky. Are these like that, or are they a much better formula? I haven't found them to be chalky, no. I think these are on the thinner side, more than anything. They are not glow in the dark. The sale bogo is till march 31st. And China glaze always carries colors very very similar to these. Just look at Sally's. I can't wait to get my hands on those glitters! They're absolutely gorgeous :D Thanks for the swatches! Very nicely done with the swatches!